Looks like everyone is geared on hacing into Kinect and getting it to do things that Microsoft claims that it can’t. With Microsoft Kinect Hacks pouring in from the gaming world, its about time Microsoft takes note of its abilities. Today the hack came in from the the Institute of Creative Technologies at the University of Southern California. A team came up with a new Kinect hack that allows users to gesture-control-play the World of Warcraft Xbox game. A custom tool kit was designed to make this happen and is called Flexible Action and Articulated Skeleton Toolkit (FAAST) which let Kinect hackers to analyze Kinect’s image processing and motion-sensing technology to develop middleware that can interact between the user and the Kinect. The middleware was further tweaker to allow integration of full-body controls with games and other applications. This is done by the middleware that captures user’s body skeleton to an smart processor and translates user’s actions into keyboard controls. This whole setup allowed users to convert the World of Warcraft game into a Kinect-game with the user as the controller himself! The university says the code is freely available for non-commercial use only. 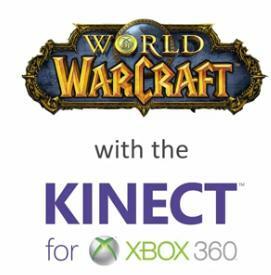 Check out the Video of World of Warcraft being played on a Kinect! Previous Sony Playstation App for iPhone and Android Soon! Play with an goblin or an Worgen character right now!